Are you looking for a nicely styled mirror for your wall? At Contemporary Heaven we have lots of great Umbra Wall Mirrors for you to choose from, so take a look and see what you can find that suits your taste and décor. Mirrors have multiple uses when it comes to interior design. Of course, they’re good for checking your hair is ok or your tie is straight when you leave the house, but you can do so much more with them. Correctly hung, they can brighten your room by reflecting the natural light from a window. They can also deflect the eye or become the focal point of the whole room, and a very large mirror can create the illusion that the room is much larger than it really is. Let’s have a look at some of the Umbra Wall Mirrors we have on offer at Contemporary Heaven. This cute and stylish Umbra Wall Mirror is perfect for hallways, porches, and bathrooms because it has 5 handy hooks for jackets, bags, scarves, or your bathroom accessories. The mirror itself is arch shaped, frameless, and mounted onto a white wood background. At approximately 50.8cm x 40.6 cm it’s a useful size and comes with all the mounting hardware you need to fix it to your wall. Wow! That’s what most people say when they see this mirror for the first time. With shades of Art Deco, the Prisma is an Umbra Wall Mirror with stunning visual impact. The three-dimensional wire frame casts shadows that overlap creating different shapes on your wall, and the mirror can be hung horizontally or vertically. We’ve even seen them used as a vanity tray on a dressing table. If you’re looking for something to reflect the light and make a statement, this will do it. 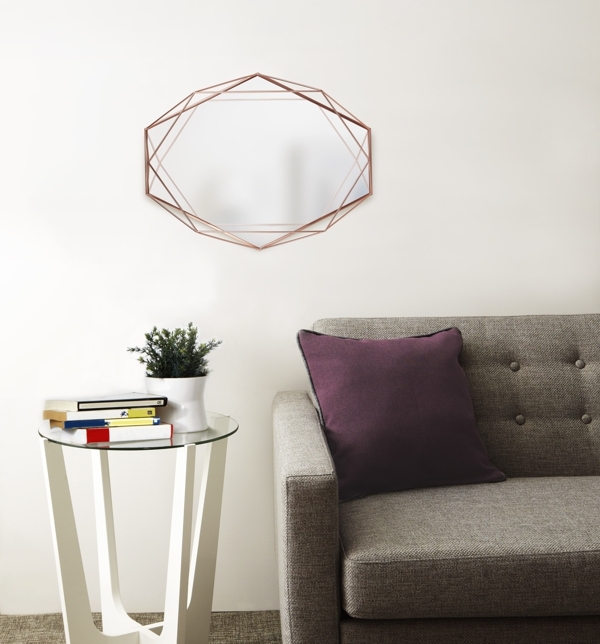 The ‘Hub’ is an Umbra Wall Mirror that everyone will love for its style and simplicity. Nicky said, “I Love it so much I am about to buy another! “ and Alexandra told us “Contemporary Heaven provided me with the best price and the mirror is gorgeous”. We have other Umbra Wall Mirrors available along with others from other manufacturers. Visit our website, then buy with confidence using our secure payment system.